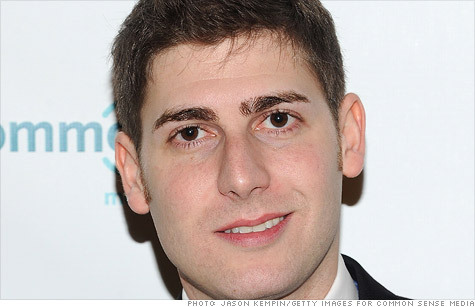 Eduardo Saverin is no longer a U.S. citizen. NEW YORK (CNNMoney) -- Eduardo Saverin, one of Facebook's four co-founders, has renounced his U.S. citizenship, according to the Internal Revenue Service. The expatriation, first reported by Bloomberg, comes just before the social network is expected to launch an initial public offering of its stock next week. It's possible that the move will help Saverin escape some of the hefty taxes he'd have to pay on his Facebook stake, though it's not known exactly how much of the company Saverin currently owns. He owned 5% of the company's outstanding shares as recently as 2009, according to "The Facebook Effect," by David Kirkpatrick, but he has sold off some of those shares since then. He was not listed among those owning 5% or more of the company in Facebook's pre-IPO regulatory filings. The Brazilian-born Facebook co-founder became a U.S. citizen in 1998 and has been living in Singapore since 2009, but the United States requires its citizens to pay income taxes no matter where they live. Saverin, who provided some of Facebook's initial financing, has not played an active role in the company for many years. If Facebook's valuation takes off next week, the move may turn out to be a savvy one -- at least from an investment standpoint. If Saverin is still holding any of his Facebook stake, formally leaving the U.S. could lessen his future tax hit. A spokesman for Saverin said the expatriation was done for logistical purposes, "not for tax reasons." The move was made months ago, he added. "Eduardo recently found it to be more practical to become a resident of Singapore since he plans to live there for an indefinite period of time," spokesman Tom Goodman said in an e-mailed statement. "He still has very strong ties to Brazil and is extremely passionate about not only his homeland, but also the U.S."
The practice of renouncing U.S. citizenship, though still extremely rare, is becoming more common: 1,781 Americans did it in 2011. That's up 16% from 2010 and is nearly eight times the number who expatriated in 2008, according to the U.S. Treasury. Taxes are expected to take a big bite out of many Facebook shareholders. CEO Mark Zuckerberg, who co-founded the company with Saverin and two other Harvard classmates, is selling 30.2 million shares of his stake in the company to raise $1.1 billion in cash. He plans to use most of it to pay off Uncle Sam and California for the taxes he expects to incur from exercising some of his stock options. Facebook said in a recent regulatory filing that many employees will have to pay 45% in taxes on the millions of dollars they will come into once the stock becomes publicly traded. The average tax hit: $1.1 million per employee. The social network is expected to price its IPO on Thursday in a range it currently estimates at $28 and $35 per share. It plans to begin public trading on Friday.